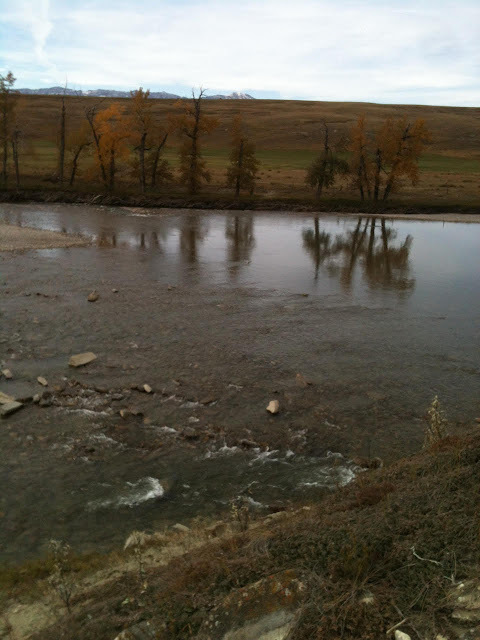 Several landowners who own property adjacent to the Oldman River in the Porcupine Hills area north of Cowley (northwest of Pincher Creek) have expressed concerns about a river diversion project that was underway in the riverbed earlier this week. The photos and video attached to this article were taken on Monday, September 21. A backhoe operator was observed creating a rock and gravel dam of significant proportions, evidently designed to channel the river away from the west bank of the river, toward the east bank, at a juncture just before an area of the river that divides into two branches. Based on the video and photographic evidence, the diversion project includes one major blockage of the west river branch that crosses most of the river, and another dam running almost parallel to the east bank that seems designed to channel the river along a planned pathway. Numerous tire tracks in the river bed were also observed, surrounding the site and leading to it from the west bank upstream of the construction. I arrived in the early afternoon, at the invitation of a landowner on the east bank of the river. From there the scene was clearly visible. At approximately 2:30 pm on September 21 the work stopped, the backhoe was parked, and the driver exited the backhoe. Approximately an hour after that a pickup truck with what appears to be an Alberta Conservation Officer logo appeared at the site. Two people (possibly Alberta Environmental Protection Officers) from that vehicle were seen consulting with another man for approximately an hour, walking the length of the larger of the two dams and taking pictures. After they left, the work did not resume. Government of Alberta Senior Public Affairs Officer Jamie Hanlon, responding to my inquiries, "A portion of work conducted to date fell outside of an approval issued under the Water Act (WA). After responding to a public complaint on September 21, all work was ceased. We will be working to determine the extent of non-compliance with the WA and if any remedial measures may be required to address impacts to the river." Dr Alan Garbutt is one of the concerned landowners in the area. "We own land just north and south, upstream and downstream of the digging site." Garbutt said he was concerned about the project itself, and with the "lack of notification and consultation" preceding the work. He said he found out after the work had commenced. "I got a phone call from my wife, who got a phone call from neighbours. I have never seen anything like this before." "I have already notified Environment and Parks, the Minister, I have notified our MLA. I have notified the leader of the Liberal party..." said Garbutt. "The MLA (Pat Stier) was in touch with me first thing this morning. I talked to researchers in his office." "As an Albertan, there is no way that you should be allowed, or even think about desecrating hundreds of metres of the stream bed. He has effectively destroyed that. He has probably destroyed anything downstream from there for several miles." "Anything that lives on the bottom of the river in the area that he was working is destroyed. From the bank in those pictures you can see that machine ran over everything. Both sides of the river, the full width of the river length, I'd have to go out there with a tape measure, but looking at the pictures and looking from above, it looks like it's hundreds of metres." "Water's still flowing down the west side, but looking at it sounds as if he was trying to move the river over to the east bank." Dr. Garbutt said he believes the apparent attempt to divert the river is doomed to fail. "The river will decide were it flows very quickly. It's only two years since it did its number the last time. I know on our property just downstream from there when that flow came through, it was more than 15 feet above the normal water level. If you get a 15 foot rise in water, it's going to go over everything down there." Another adjacent landowner, who asked for anonymity out of an expressed fear of possible reprisals said "I don't even know how he got permission." "Why aren't you asking your neighbors if it's okay, number one. Number two, we have endangered species in the river. I phoned (a neighbour approximately 2 kilometres downstream of the construction site), and he says he's got silt all the way down to his place." "If you want to move a rock out of this place and you have to jump hoops, and do ten tons of paperwork." "I know he is using 'my house is being threatened by the river', and the key is it shouldn't be because you were in the flood of '95, you were taken out by a boat, because you flooded, and then you knowingly rebuilt in the same place. He chose to rebuild in the flood plain." "It appalls me to see such destruction in our sacred river. We rely on the Ministry of Environment to protect all the species on and in the Oldman River. I cannot believe that this landowner managed to do so much damage and it took another concerned landowner to report this travesty. What about the machinery in the river, did the company he hired have biodegradable oil and lubricants? Where were the booms and silt screens that are required prior to the machinery entering the river? Where were Oceans and Fisheries? Is this part of Government cutbacks?" "Landowners on the Oldman or any river should be informed of any activity before approval no matter how small, as is stated in the guidelines for the application and approval process. They gave him an inch and he took a mile!" "We all are very upset and have expressed our concerns to multiple government agencies along with Shannon Phillips (Minister of Environment, NDP), also leaders of all opposition parties. Our Government needs to do the right thing and fine the individual for committing this extent of destruction to the river flow and all inhabitants. Oceans and Fisheries need to fix the river and make the landowner financially responsible for the restoration." "We all enjoy, along with fishermen who travel great distances, all the rivers in this area, we must be diligent to report all suspicious activity on our rivers, lakes and streams." The source said similar work was done at the same site last year, on a much smaller scale. "This is way more than he did last year." "This current obstruction of our beautiful river is a travesty to all who enjoy this resource. We ask ourselves how can someone have such a disregard for a river to rip it up in such an extreme manner?" Alberta Liberal leader/Calgary-Mountain View MLA David Swann is also a former resident of Pincher Creek. In a phone interview he commented on the situation, saying that the official processes already in place for dealing with situations of this type must be followed. "We need to look at what was approved in terms of activity in the river bed. My assumption is that Alberta Environment would not allow this level of intervention in a river system. My assumption is that this has gone beyond reasonable protection for a site. But it's now in the hands of Alberta Environment and we need them to review this situation and rule on whether or not this was above and beyond what they had approved." "Having said that, there are grave concerns about this, the lifeblood of southern Alberta being in any way compromised, not only from the point of view of vital water supply, but also from the point of view of fisheries, and the threatened species. The fisheries activity is world renowned down there." "Every indication I have about the Oldman River and its vulnerability not only to the natural infux of soil and agricultural runoff, but also upstream impacts, whether it is off-roading, or logging, or oil and gas development, is that this river system is critically important to southern Alberta, and it's in danger." "I expect the Alberta government to do everything in its power to ensure that we do protect that river to the nth degree. It is a vital lifeblood of southern Alberta and we have to be extremely careful. We have to put in more protections, in fact, than I have seen in the past, and we have to start moving upstream to protect the headwaters in a much more comprehensive way." "I fully support Alberta Environment holding accountable any particular local development and local impact that is going to adversely affect both the river and the fisheries." Several government representatives and environmental protection organizations have been contacted by this publication for comment and clarification, a process that began September 21. To date we've heard from Government of Alberta Senior Public Affairs Officer Jamie Hanlon, who has been quoted above. The landowner undertaking the work has not been officially identified to this publication.